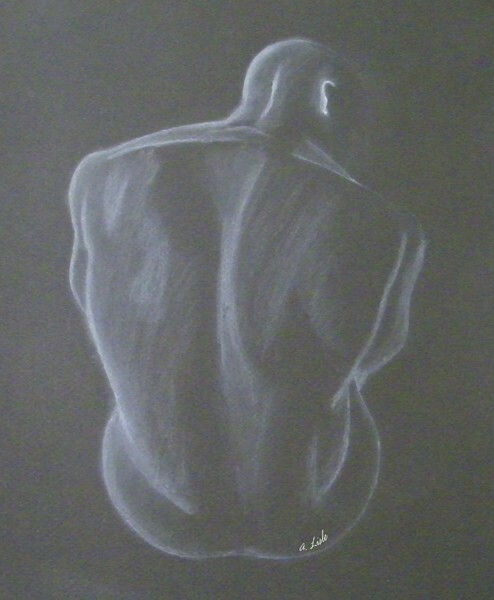 I wanted to try this technique (white on black paper). So I was flipping through a couple of modeling books (for artists), looking for an image. After a few pages, all the people start to look the same, but then, I stumbled on this photo of a gorgeous black man (whose name I do not know). The first thing that caught my attention was his ear. It really did seem to pop out at me, like it does in this drawing. I thought of a couple things while working on this. First, I thought of a certain friend, Tarringo T. Vaughan, who has a blog called Diary of a Gay, Black Man. The strength visible in the model's back is, in a way, a visual metaphor for the strength I see shining through Tarringo's writing. Love you Tarringo - keep on writing those awesome poems! Second, I just finished Laurell K. Hamilton's Swallowing Darkness. Doyle (aka The Queen's Darkness) is one of my favorite characters and I thought of him briefly, while working on this (those who have finished the book may think of a certain title he temporarily held but I don't want to give away any spoilers so...read the series). Wow! not that I ever doubted your ability before but this is amazing. I can honestly say this is my favorite from you so far. It is elegant, and I have a feeling it will be showcased somewhere in our house quite soon! Artist Reply: :-) I would kind of like to put it in either the kitchen or dining room (where it stand out against the color), or maybe in the stairwell, where everyone will see it. What do you think?